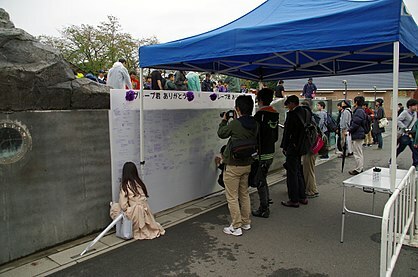 ↑ 1.0 1.1 "東武動物公園からのお知らせ" [Notice from Tobu Zoo] (PDF) (Press release). Tobu Zoo. 13 October 2017. สืบค้นเมื่อ 18 November 2017. ↑ 2.0 2.1 2.2 "Romantic penguin dies, with object of desire by its side". The Straits Times. Agence France-Presse. 15 October 2017. สืบค้นเมื่อ 20 October 2017. ↑ 3.0 3.1 Isashi, Keigo; Rachael, Krishna (22 May 2017). "This Story About A Penguin Falling In Love With An Anime Cutout Is An Oscar-Worthy Love Story". BuzzFeed News. สืบค้นเมื่อ 18 November 2017. ↑ 4.0 4.1 4.2 4.3 Gladwell, Hattie (23 May 2017). "Elderly penguin falls deeply in love with an anime cut-out". Metro (in อังกฤษ). สืบค้นเมื่อ 20 October 2017. ↑ Coleman, Alestair (13 October 2017). 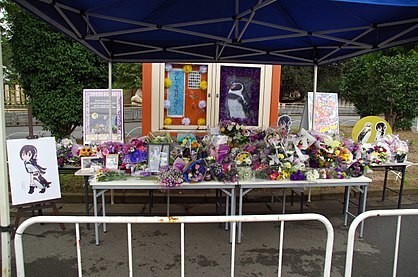 "Japanese zoo mourns anime-loving celebrity penguin". BBC News. สืบค้นเมื่อ 18 November 2017. ↑ Schwartz, Drew (13 October 2017). "Love Is Dead, and So Is the Penguin Who Fell for a Cardboard Cutout". Vice News. สืบค้นเมื่อ 20 October 2017. ↑ 7.0 7.1 7.2 7.3 7.4 Rogers, Jon (2 May 2017). "Pick up a penguin? Humboldt bird falls in love with his future waifu placed in his pen". Daily Express. สืบค้นเมื่อ 3 November 2017. ↑ 8.0 8.1 8.2 8.3 8.4 "Penguin Grape-kun meets voice actress of his anime girl 'waifu'". Philippine Daily Inquirer. 21 May 2017. สืบค้นเมื่อ 3 November 2017. ↑ 9.0 9.1 9.2 Bayle, Alfred (15 October 2017). "Grape-kun, the anime girl-loving penguin, dies; fans mourn loss of a comrade". Philippine Daily Inquirer. สืบค้นเมื่อ 20 October 2017. ↑ Lasic, Gillan (2018-01-10). "Internet famous penguin 'Grape-kun' got reunited with his anime wife as a cardboard cutout". Inquirer.net. หน้านี้แก้ไขล่าสุดเมื่อวันที่ 1 มกราคม 2562 เวลา 21:16 น.